Keep your OnePlus 3 or OnePlus 3T safe with the finest in edge-to-edge protection. Thanks to a smudge resistant oleophobic coating and enhanced impact protection, the curved screen protector shields your smartphone, while enhanced optical clarity and high luminosity accentuate the clarity and vibrancy of the display. Disclaimer: To ensure the curved screen protector offers optimal protection while maintaining the sleek look of the OnePlus 3 and the OnePlus 3T, the colored border extends over the edges of the display by approximately 0.9 mm. Our protector was optimized for optimal light transmission to ensure full transparency. The OnePlus 3/3T’s brilliant display is enhanced by the protector’s great optical clarity, and its high luminosity accentuates the vibrancy of the screen. The Curved 3D Tempered Glass Screen Protector is available in two different color variants, serving as the perfect complement to your device. Whatever color you end up choosing, you can count on this screen protector keep your OnePlus 3 or OnePlus 3T safe. 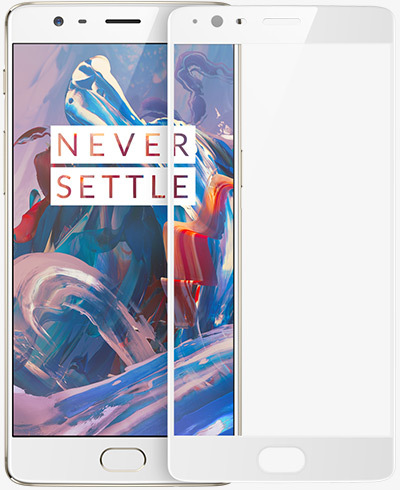 The White variant is just as vivid as the OnePlus 3/3T Soft Gold. The Black screen protector pairs naturally with the graphite color variant of the OnePlus 3/3T. 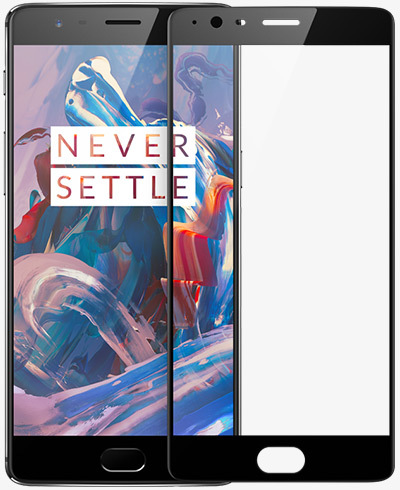 OnePlus suggests to use OnePlus 3/3T Curved Tempered Glass Screen Protector (Black) for OnePlus 3 Graphite, and use OnePlus 3/3T Curved Tempered Glass Screen Protector (White) for OnePlus 3 Soft Gold. Please note that the name on package is printed as "3D Tempered Glass Screen Protector".